Cape St. Claire is a water oriented community in Anne Arundel County, MD, and is located about 6 miles northeast of the City ofAnnapolis, Maryland. Cape St Claire is a wonderful waterfront community with unprecedented access to the popular Chesapeake Bay that makes it a great place to own real estate. 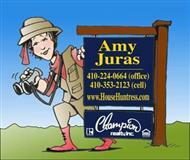 And the it is the House Huntress's own neighborhoodMajor cities located nearby include Arnold, Annapolis and Severna Park. Being an attractive waterfront community that is centrally located close to other big cities, purchasing a home in Cape St Claire is a solid real estate investment. Living in Cape St. Claire, residents have exclusive access to the waters of the Chesapeake Bay. The community of is complete with 3 private beaches, 4 community piers, 200 boat slips and launch, all of which are accessible only by residents of this community. Anyone´s dream home can also be found here, with popular housing options that includes split level houses, single family homes, million-dollar waterfront homes, colonial homes and contemporary style properties. People seeking this community include those looking for their first home to people buying luxury real estate with impressive views of the Chesapeake Bay. Prices on homes can range anywhere from the $200,000´s to over $3 million homes. Most first impressions that people get from this area is its community oriented appeal and friendliness, so indeed, it´s no hard to see why many residents wouldn´t want to be anywhere else. Plus with good schools, open parks, city services and local shopping as well as those of downtown Annapolis just minutes away, residents have everything at hand. So if you are looking for unique waterfront properties, consider Cape St. Claire real estate today. Search the perfect home or land you are looking for on this site with free access to the Anne Arundel County MLS provided. See hundreds of homes online that can include: single family residential homes, lender repossessed, 2-4 unit properties, condominiums, rental homes, full utility lots and more. With the MLS-IDX feed linked on this property website, the listings are update to date and streamed directly from the regional MLS, all provided at no cost to visitors! So we invite you to use this website often. To learn more about where the best deals and value can be found, contact me today!